On Tuesday 13 at 19:30, Madrid’s Teatro Real will play host to the 10th BBVA Foundation Frontiers of Knowledge Awards Gala Concert, a prelude to the formal ceremony that will take place the following day at 19:00 in the Marqués de Salamanca Palace, Madrid headquarters of the BBVA Foundation. The concert is a tribute to the laureates in this 10th edition of the awards: Omar Yaghi in Basic Sciences; Shafi Goldwasser, Silvio Micali, Ronald L. Rivest and Adi Shamir in Information and Communication Technologies; James P. Allison in Biomedicine; William Nordhaus in Climate Change; Rosemary and Peter Grant in Ecology and Conservation Biology; Timothy Bresnahan, Ariel Pakes and Robert Porter in Economics, Finance and Management; Nubia Muñoz in Development Cooperation; and Kaija Saariaho in Contemporary Music. The music will be performed by the Orquesta Sinfónica de Madrid, the resident orchestra at the Teatro Real, led on this occasion by Pedro Halffter. The program will open with the Overture to Fidelio, Ludwig van Beethoven’s only opera. Next will come Laterna Magica, by Kaija Saariaho, this year’s winner of the Frontiers Award in Contemporary Music, a composition exploring the shared ground between music and film, which draws its inspiration from Ingmar Bergman’s autobiography of the same name. After the interval, part two will begin with Gustav Mahler’s Symphony No. 1 in D major, a work that perfectly illustrates the depth and breadth of the German composer’s musical cosmos, and end with Tiento del primer tono y batalla imperial, by Cristóbal Halffter, the first composer to win the Frontiers of Knowledge Award. Her entry to opera was similarly hesitant, and it took her eight years to write her first: “I didn’t know who would be interested or if I could even do it,” she recalls. “But finally the means came together to make it possible.” What drew her to the genre was “the way we can see ourselves reflected in the characters,” and the opportunity it gave “to address the great issues that affect us all.” Her debut came in the year 2000 with L’amour de loin (Love from Afar), which deals with universal themes of love and death through the story of the 12th-century troubadour Jaufré Rudel. The acclaim which greeted this collaborative venture with librettist Amin Maalouf and director Peter Sellars would be repeated some years later with Adriana Mater (2006) and Émilie (2010). 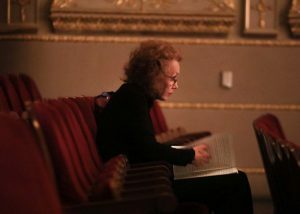 Saariaho would also work with Sellars on Only the Sound Remains (2015), based on two Japanese Noh plays translated by Ezra Pound and Ernest Fenollosa, which will have its Spanish premiere in Madrid’s Teatro Real in October this year.